I excited today to share with you two looks and how to take this lovely peacock patterned top from Fabrizio Gianni from a Day to Night Look. We all love to make the most out of our wardrobes, and buy pieces that can serve us in many ways, or make our closets more versatile. Fabrizio Gianni has come out with a new line of V Neck patterned tops for fall with some fun fashionable looks. 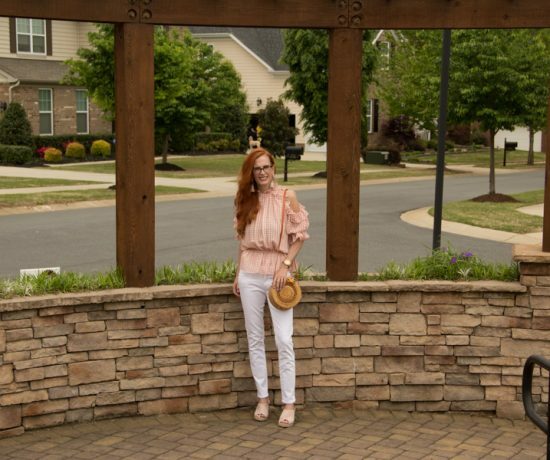 You have seen this style top on me, in a bright rasberry color when I showed”How to Wear Brights . 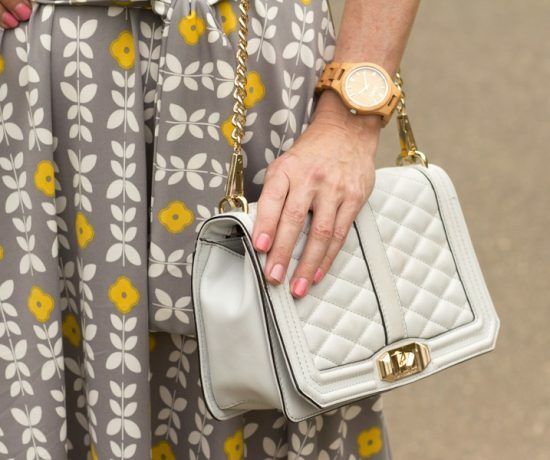 These patterns can be dressed up and down, in ways I am going to show you today. The pattern stood out to me, as I love the shades of blue and moss green and lets face it, the peacock is a beautiful bird! I am doing my best here, to strut my struff! The Day time look with all of the colors of the top, I thought I would pair it with an a-line teal skirt I have for fall I wanted to bring out more of the blue and green and compliment the top. Adding a black croc JJ Winters clutch kept it professional and stream lined, as well as the black tights and Coach bow kitten heels. 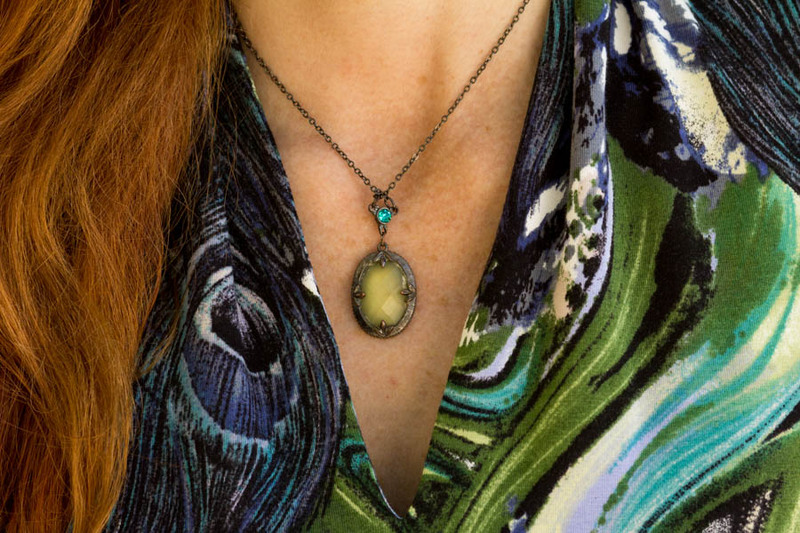 You all know I love jewelry and often look for unique, vintage, or vintage inspired pieces, and this necklace fit the bill with the teal stone, and green oval center it was a perfect match. I actually used to wear alot of browns, blacks and neutral colors when I was in college, however, if you know me now, I love color! What more of a beautiful season is fall with all of its glorious colors, and sharing the love of color with what one wears. 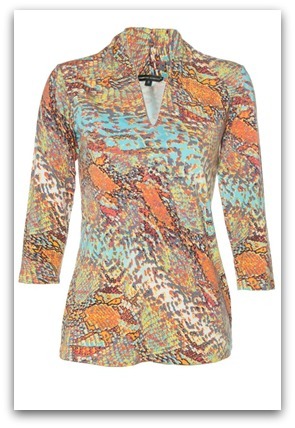 The patterned tops have many colors to choose from and add more color and print to your wardrobe! Just another example, if I wished to style one of these tops for fall, the Zodiak print, at the bottom right, I might pair with a velvet burnt orange blazer, and some burgundy pants or maroon jeans like these from Fabrizio Gianni HERE and brown ankle booties to pick up the colors in the top Both colors are on trend this year. It is wonderful to play with color and fall is a great time to do so with all of the beautiful color palettes in nature this time of year as well! Tell me, how might you style one of these tops for fall? You will be seeing more of the Anthro Vegan jacket this season, as the back has quilting detail and ruffles at the bottom. 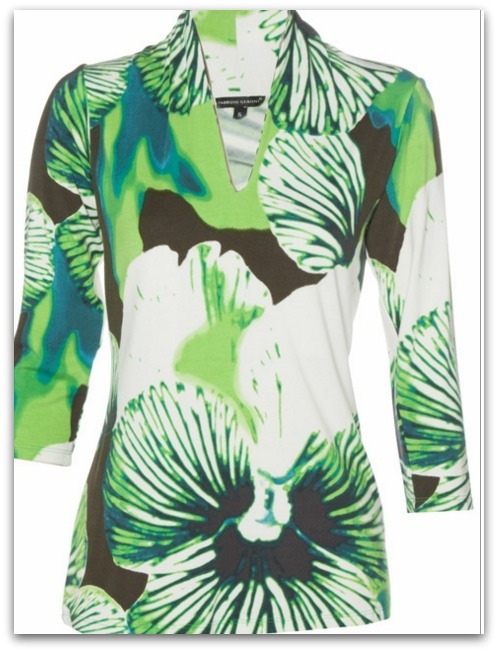 Fabrizio Gianni is giving my readers a chance to win one of these lovely tops to add to your fall wardrobe!! 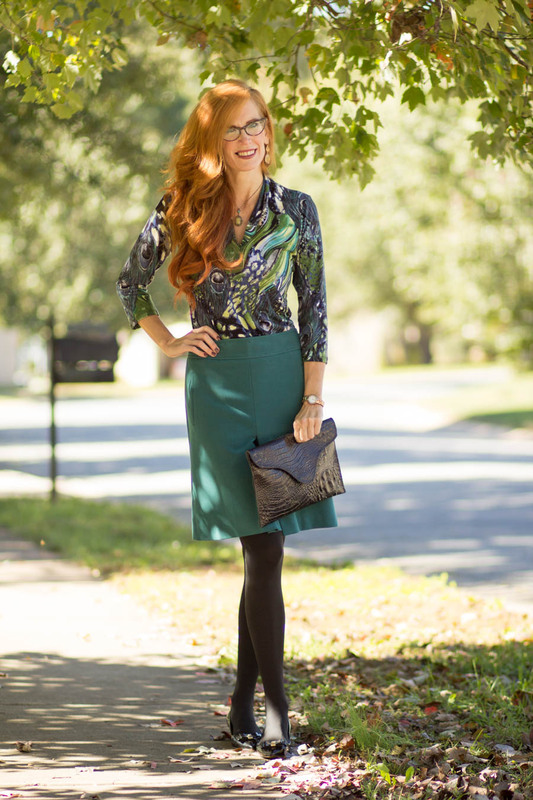 ADD SOME COLOR AND PATTERN TO YOUR FALL STYLE! GOOD LUCK LADIES! The Mist colored 3/4 Jersey top. I just discovered your blog. Thanks for the chance to win, I love these! They are very nice and your pictures are great too! I love your apparel, so classic and can dress up or down, it is my favorite brand especially for pants and tops. Want to try the jackets and jeans next. 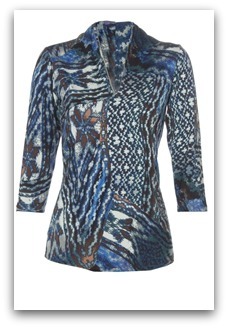 Hi Mary, the top I chose for the wonderful colors, and the denim knit or cotton denim are super comfortable as well. Thanks for stopping! 2 great looks! I have the same skirt (in several colors) and hoping I will lose the weight so I can wear them again. Your peacock patterned top is stunning, such an incredible pattern with colours that are perfect for you. What a lovely top! You created two perfect outfits with it and look fabulous! You are dressed impeccably!Have a nice week! Thank you Danielle, I hope you tried to win one from the FG fall collection. I appreciate the lovely comments. You do the same. Beautiful tops and I very colorful! Thank you Vale! What lovely comments. I am mostly a skirt girl, but am getting more comfortable wearing jeans. I love teals and green, again,thanks my friend! I love the one with the greens. It is so beautiful. That top is gorgeous! I love both of these looks, especially the night time with the moto jacket! I love dark greens for Fall. 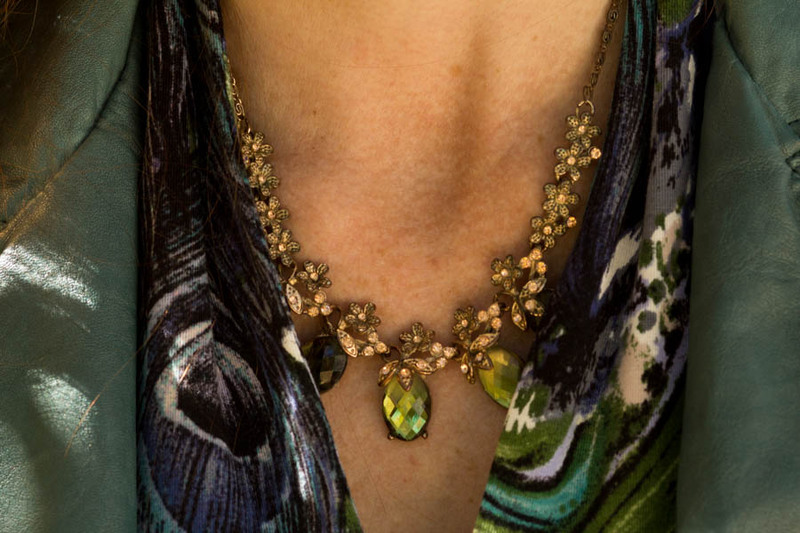 My current outfit has some olive on the dress – check it out. I love your top, moto jacket (I own an almost identical one in olive green) and pencil skirt are all gorgeous JESS. I’m loving anything in teal color and you are simply stunning! Such a lovely print! I love it layered under that jacket! Jess, these two looks are great on you!. I love your knack of making the casual items look smart and feminine….that jean and jacket combo, for example, with the delicate jewelry and that yummy nail colour! You look every inch a lady. 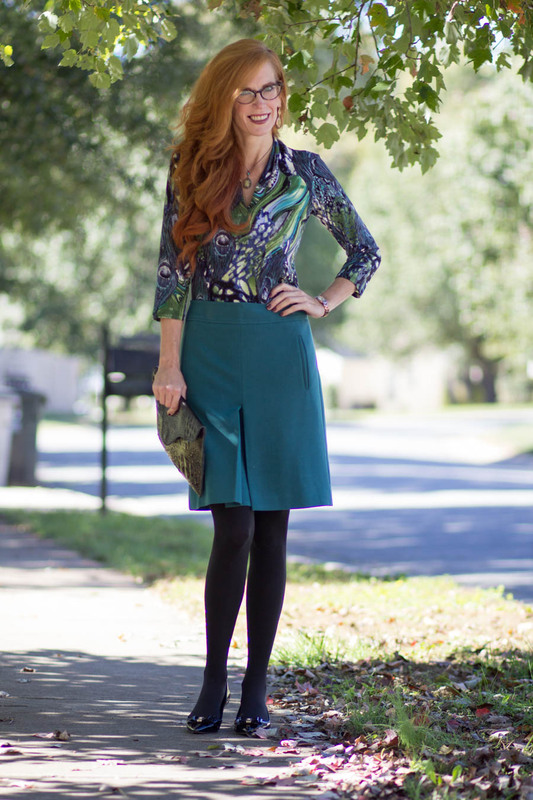 My favourite look is your kick-pleat A-line skirt…..That colour! The cut! Your fabulous legs! Just stunning. 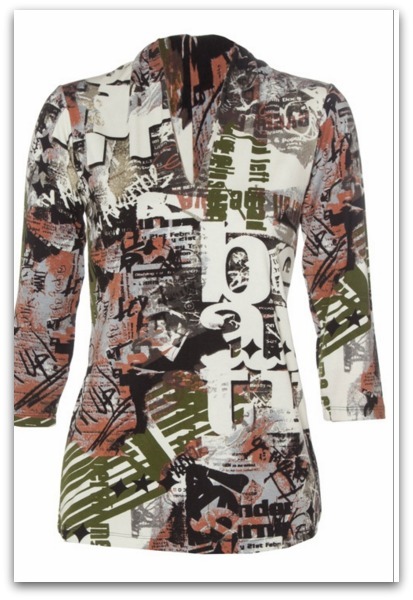 The patterned top looks amazing with your colouring. I would probably style the first top (with the lettering) pairing it with tweed trousers (7/8th length) and chunky heeled boots….maybe a herringbone or a subtle houndstooth print? Toning everything down with my old denim jacket and a fabulous bag. I think these look very versatile. These arent even my low rise jeans 🙂 I have plenty of William Rast jeans, a Justin Timberlake designer line that came out years ago, that I love to wear, and they are lower rise, but not too low. But boy, you are too good for my ego! I love the idea for styling the top you mentioned, and appreciate it, as you were the only person commenting on how they would style one of the tops. Love the idea of tweed or herrinbone, it would be great and I could see you styling it with your flair and textures. What a great top! I love the pattern and colours of it. The pencil skirt with the slit in the front is awesome too! Thanks hon! I So glad you like the top and I am a big fan of teal, have had this skirt for awhile now. That blouse is GREAT. Reminds me of Van Gough’s Starry Starry Nights. Thank you! I can see that 🙂 Glad you like it! That top is so fun & I love the color of your skirt too!